Over 200 delegates from government departments, agencies and public bodies met in London on 11 May for the FDA’s 2017 Annual Delegate Conference. FDA General Secretary Dave Penman kicked off the 2017 Annual Delegate Conference (ADC) by reprising the unpredictable events of the previous 12 months. Not only did his beloved Partick Thistle secure a top-six finish in the Scottish Premier League, but the UK voted to leave the EU and found itself in the midst of a third national plebiscite in as many years. On the implications of Brexit, Penman told delegates: “Whether you agree with the referendum result or not, Brexit is the most important issue our country faces”. Despite the election campaign rhetoric about ‘strong and stable leadership’ from politicians, “the reality is that it will be the civil service that will be asked to do the heavy lifting”, he added. Penman introduced what became the recurring theme of the conference, telling delegates that “Britain needs a strong civil service” to deliver the best possible outcome from the Brexit negotiations and maintain quality public services. Conference later unanimously approved the launch of a new campaign to press the incoming government to invest in the strong civil service we need to meet the challenges ahead. A proposed change to the financing of FDA sections led to a lively debate on the day’s first motion, which set out plans to reduce rebates to sections that already have large reserves. Moving the motion on behalf of the Executive Committee (EC), David Chrimes from the Crown Prosecution Service (CPS) section explained that the new rules were “all about ensuring a strong stable future for the FDA” and avoiding “pockets of money” building up which “perhaps are not invested in the best way”. Delegates from the Association of Revenue and Customs (ARC) Cambridge branch opposed the motion, with Graham Flew warning that the change could potentially “take a third of the income” from sections, and Frances Hunter describing it as “a little bit like a money grab”. But they were followed by a string of speakers from other ARC branches, the Diplomatic Service Association (DSA), Procurator Fiscal Service, Ofsted and CPS supporting the rule change. While acknowledging ARC Cambridge’s concerns, the EC’s Fiona Eadie said she was confident that sections would get financial assistance when required and argued the change would allow union funds to be used for “the greater benefit of all of our membership”. 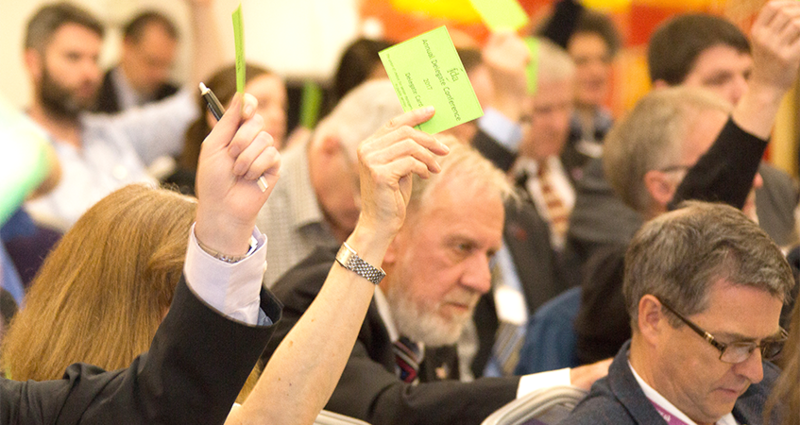 The motion was ultimately passed, paving the way for conference to later freeze FDA subscription rates for five years (see page 10) – reducing financial burden on members at a time of pay restraint and providing an important recruitment tool for the FDA. Conference called on ministers to extend their support for worker directors on company boards to include civil service departments, agencies and public bodies. “You look at most successful football clubs, they have fans on boards. Most successful companies have trade union representatives on boards, with non-executive directors who are experts in those fields,” said EC member Stephen Head from the CPS section. Conference also backed a motion from the DSA calling on ministers to publicly defend civil servants and the political impartiality of the civil service. The DSA’s Matthew Lownds condemned media attacks on British diplomats and judges, and the lack of a robust response from ministers. He urged ministers to ensure public servants are “duly recognised, not denigrated at every opportunity when things may seem to be going wrong from a narrow political point of view”. Richard Hobbs from the British Museum branch successfully moved a motion calling for greater recognition for the expertise of staff working in museums, galleries and libraries. “The intellectual heart of those institutions is being undermined,” he warned. “There is a sense that… the specialist knowledge that is required to understand the collections, material, culture and so on is not really being supported by management and ministers,” he added. “The Government expects top quality policy advice and service to be delivered on mean, out-of-date and falling- behind levels of pay,” DWP delegate Mike Buckley told delegates during the debate on civil service pay, which saw conference back calls for an independent pay review body for the entire civil service and an end to the Government’s 1% cap on pay rises. Chris Mills from HM Land Registry said many members felt “the Government treated public sector staff with disdain”, with pay falling in real terms and higher pension contributions for reduced benefits. “Pay restraint is going to have an effect on public sector workers for the rest of their lives,” he added. Delegates backed a motion calling on the Cabinet Office to learn the lessons from the extensive machinery of government changes that followed Theresa May’s accession as prime minister last year. Conference heard how staff transferred to the new Department for Exiting the EU and the Department for International Trade faced delays in receiving appointment letters, payroll problems and confusion over terms and conditions. Delegates strongly backed a motion calling on departments to prioritise retaining skilled and experienced staff as ministers press ahead with the Government Hubs relocation pro-gramme, which aims to reduce the government estate from around 800 to 200 buildings by 2023. Moving the motion for the EC, Tony Wallace from ARC Nottingham told conference the FDA has a “crucial role to play” in protecting jobs and easing the strain on staff, and pressing departments to implement proper flexible working and relocation packages. "Every person in this room and across our wider membership is a skilled professional in one discipline or another and the Government can ill-afford to lose those skills,” he said. Delegates strongly supported a motion from the Scottish Government branch calling on all UK administrations to ensure civil servants are fully paid for all the hours they work. David Howdon from the DWP branch explained how the FDA has successfully negotiated compensation for excess hours in some departments and encouraged all members to claim for them where they can. Workload frustrations were also echoed in a successful composite motion from the Ofsted and Education Scotland sections. Education Scotland’s Patricia Watson revealed that some members had worked up to 28 excess hours in a week , which she lambasted as “unlawful” and “unacceptable”. David Chrimes, CPS section, said heavy workloads often lead to work-related stress, and delegates backed his call for civil service employers to remove sources of stress and ensure workloads remain reasonable. Conference reporting by Matt Foster, Tommy Newell, Matt Ross and Craig Ryan. Photographs by Graham Martin.